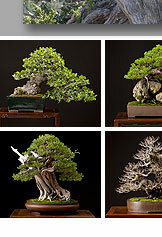 Each winter, Bay Island Bonsai members demonstrate their knowledge by staging a memorable show. This book is a photographic essay of the displays presented at the 2014 Bay Island Bonsai exhibition, our 15th anniversary. Since it was a milestone, the members chose, "Born in the USA," as the theme for the show and featured only trees that were propagated in U.S. The Bay Island Bonsai's 2014 show book contains over 100 photographs of fine bonsai and accent plants. This beautifully designed, 10x8 inch book is available in a hard cover with a dust jacket. You can order direct from the book publisher, blurb.com, by clicking the links below. Price: $61.99 (hard back). Click here. The publisher, Blurb.com, offers a variety of shipping options.